Earlier today I gave a presentation for Blockchain University hosted at PricewaterhouseCoopers in San Francisco. It covers the different startups developing permissioned ledgers, the use-cases they are looking at and the reasons for why permissionless systems are currently inadequate to fulfill similar business requirements. A couple weeks ago I was interviewed on Epicenter Bitcoin. Below is the video from that episode. We covered a number of topics surrounding permissioned ledgers and cryptocurrencies. This post will look at an amalgam of ideas touched on by Eli Dourado in a post several days ago regarding Bitcoin. This includes volatility, cross-border payments, nemo dat, settlement finality and machine-to-machine transactions. I also answered a few frequently-asked-questions that have been emailed to me that intersect with some of the same ideas. On Sunday Eli Dourado posted a response to Noah Smith and JP Koning both of whom previously discussed why bitcoin has not become a medium-of-exchange. I don’t want to turn this into a post solely on volatility so if you’re interested in other ideas, skip to the next section titled cross-border payments. The problem with Dourado’s analysis on volatility is that it does not look at what the actual causes of volatility are, the core of which is a perfectly inelastic money supply. What does it mean to have a “perfectly inelastic money supply”? In short, irrespective of the quantity demanded, the money supply itself does not change or shift. For a Bitcoin-like network, its supply is programmed to remain static irrespective of external conditions. While some advocates and enthusiasts consider this a feature, it is a bug if bitcoin wants to be used as a modern medium-of-exchange. Why? Because the only way to reflect changes in demand is through a change in price, which as described below, is done so via volatility, often violently. The three slides above appear in an April 2015 presentation by Sams. It is the nature of markets to push expectations about the future into current prices. 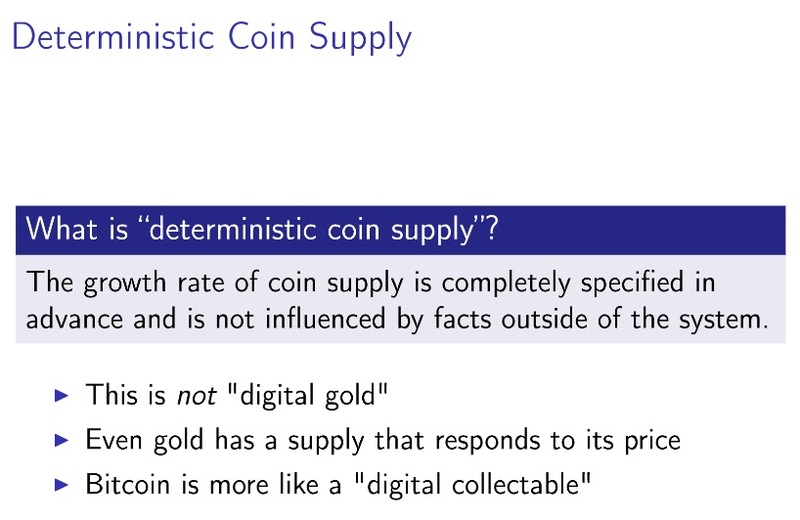 Deterministic money supply combined with uncertain future money demand conspire to make the market price of a coin a sort of prediction market on its own future adoption. Since rates of future adoption are highly uncertain, high volatility is inevitable, as expectations wax and wane with coin-related news, and the coin market rationalises high expected returns with high volatility (no free lunch). Below are a few other questions that have hit my inbox related to volatility which tie into the ideas addressed by Dourado and others above. 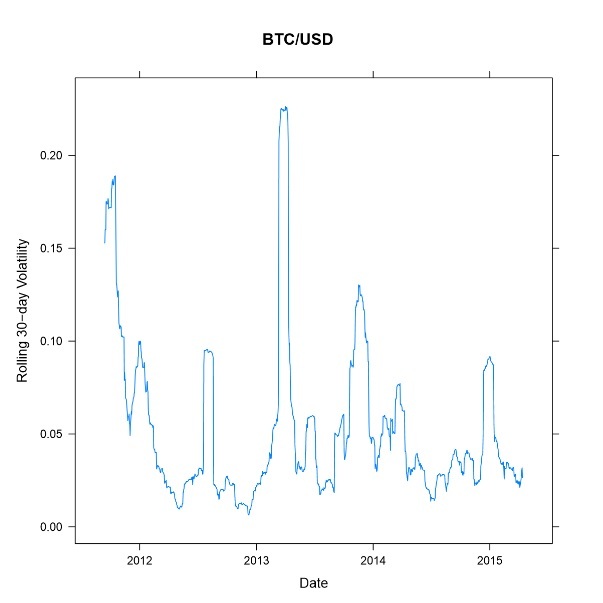 Visible volatility appears to have declined in the past 5 months, why? One possible explanation relates to the inelasticity argument: if traders “feel” that this is a good price and there is no motivation or incentive to trade, thereby moving it up or down, it will tend to stay there (i.e., trading based on sentiment). Another potential explanation for why there has been less volatility in the last couple months could be that as participants have left the market, there has been less demand from speculators due to a lack of interest and thereby a corresponding lack of volume.3 We may not know for sure what the actual trading volume is at exchanges in aggregate for years to come. For instance, contrary to the Goldman report, the Chinese RMB does not compromise 80% of the trading volume; this “volume” as discussed by Changpeng Zhao (former CTO of OKCoin) were a combination of internal market making bots, wash trades and tape painting.4 If there was a legitimate increase in demand from speculator then there would have been corresponding increases. 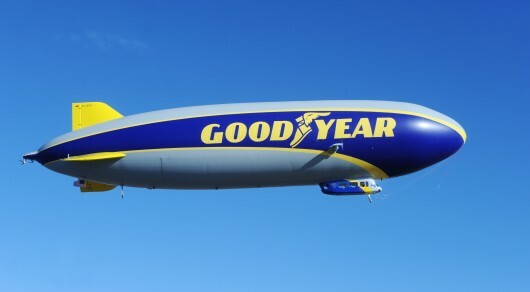 Maybe “whales” will return again after Fed tightening or concerns over Greece. Or maybe not. In addition, VC funded companies like BitPay are stating on record that they absorbing some (all?) bitcoins onto their balance sheet, this likely in the short run reduces some of the volatility but is not sustainable. Because with roughly $400,000 – $800,000 in trade volume per day that BitPay processes, it simply does not have the cash on hand to absorb all of the incoming bitcoins for more than a few weeks at most. Thus, despite the claims (video) from Jason Dreyzehner — that BitPay tries to keep all of the bitcoins that they process — after talking with several contacts at large exchanges, it turns out BitPay does in fact sell bitcoins in bulk to exchange and OTC partners. See also, A pre-post-mortem on BitPay. Another common question I have received: with a string of “positive” developments lately such as GBTC, new exchange infrastructure, and more VC funding, why hasn’t bitcoin’s price risen? 2) Speculative demand has not increased (yet) because it is now an old story for some active traders — they know what a “bitcoin” as an asset is and how to get it. As Nathaniel Popper (from NYT) discussed a couple weeks ago at Plug and Play, editors and writers at large media companies are tired of the same stories, these Bitcoin companies need to now go execute which few have actually done. What about the new exchange companies and liquidity providers being added to the market? As noted above, as of this writing the price of bitcoin is largely a function of speculative demand still. Companies like Coinalytics have looked at the on-chain data to show that there has not been much of an increase in on-chain usage or demand from above-board commercial entities.7 Perhaps that will change. Therefore if consumers are not participating, bitcoin is left with movements dictated by changes in the unpredictable demand curve (and appetite) of speculators. There are startups that provide different types of instruments: SolidX, LedgerX, Mirror, Tera Exchange and Hedgy but none has likely gotten much volume and only have limited capital to absorb the continual bitcoin production rate of miners and other sell-side participants. Again, maybe this will change over time. 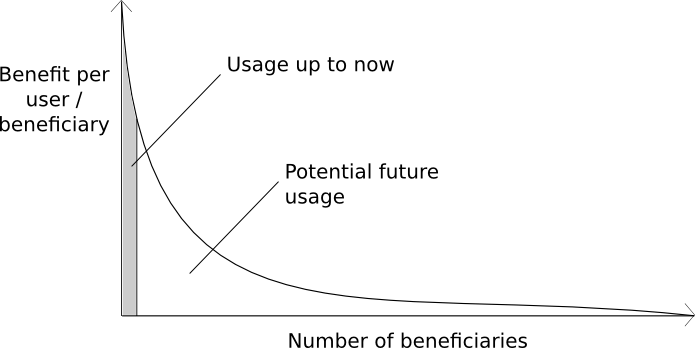 What if bitcoin adoption were to proceed more aggressively in non-currency applications (real-time securities settlement, for e.g. ), what is the impact from that on bitcoin’s price? When talking about settlement and clearing the sheer size – in dollar terms – of the FX and equity markets, it makes a 51% attack on watermarked assets much more of an eventuality than a probability simply because it’s now worth the effort to do so. Why? Because the increase in aggregate asset value transferred on a blockchain incentivizes attacks. In fact a new paper suggests that an attacker does not even need 51% to achieve their goals. How might Bitcoin help FX traders and arbitrageurs more easily and quickly align their books and execute a global strategy? What impact can the BitLicense have now that it has been finalized? Again, I’m one of the few people that thinks the BitLicense is not a bad thing — it may seem expensive but if a Bitcoin company provides the same good and service as a traditional company then it would make sense to have them liable to the same type of compliance — why do they get an exception just because of the word Bitcoin? With that said I do think that it could bring in more players who believe this now provides regulatory certainty. For example, I am looking forward to seeing how Gemini impacts the network now that there is a legitimate exchange you can “short” bitcoin on — it may provide a new incentive to destabilize the network in order to gain. The points made in Robert Sams recent post are worth looking at. It is a reason to be wary of a professional exchange such as Gemini. Also it adds to the volatility problem. It is probably just a question of time until we see some hedge fund disrupt the network somehow while profiting from it with a massive short. The incentives will be in place sooner or later. Honestly, I believe that the misconception about volatility (“it will go down over time”) might blow up in the face of many people. The argument that Robert Sams makes is strong. As long as supply cannot be dynamically adjusted to match changes in demand expectations (essentially what the Fed is trying to do) volatility is unlikely to decrease. It is worth pointing out that a trader can currently “short” bitcoin on Tera Exchange and Crypto Facilities via their forwards contracts (and swaps in the case of the former). So far the only participants interested are miners for obvious reasons (though it is unclear if anyone involved is generating much revenue yet). It is also unclear what the incentive for doing a swap is too, with the inability to predict or model exchange rate changes months into the future. It is more about the implied volatility which for bitcoin, is always higher than other asset classes and the reason I believe this is because bitcoin is still a giant unknown. Bitcoin continues to trade mainly on sentiment and technicals as well, and this in turn makes it by nature a more volatile asset. Kraken, the San Francisco-based crypto currency exchange, is launching a new “DarkPool” option for volume traders who want to buy and sell coins in larger orders. Typically, large orders in the exchange swing the price of bitcoin dramatically, but with the new dark pool trading option, it lets people or institutions order in a way that the rest of the market does not see. Think of it as a level of privacy for people buying or selling bitcoin in bulk. The service will cost users an addition point-one-percent on orders. Kraken is not the first exchange to bring a “dark pool” to market. In 2013 Tradehill launched a service called “Prime” that purportedly acted as a “dark pool.” In addition, one of the attractions to LocalBitcoins may be that it does not require traders to provide identification (via KYC); its volume could decline if it tried to comply with similar KYC/AML/BSA requirements that many other exchanges do. Dourado’s explanation for how credit card processing work is not fully fleshed out. For a more detailed explanation I recommend readers peruse two posts from Richard Brown found below in the notes.13 In short, Dourado’s explanation for the alleged value proposition between Bitcoin versus a credit card ignores the biggest difference: there is no native credit facility or lending ability on the Bitcoin network. At best the comparison should be with debit cards. 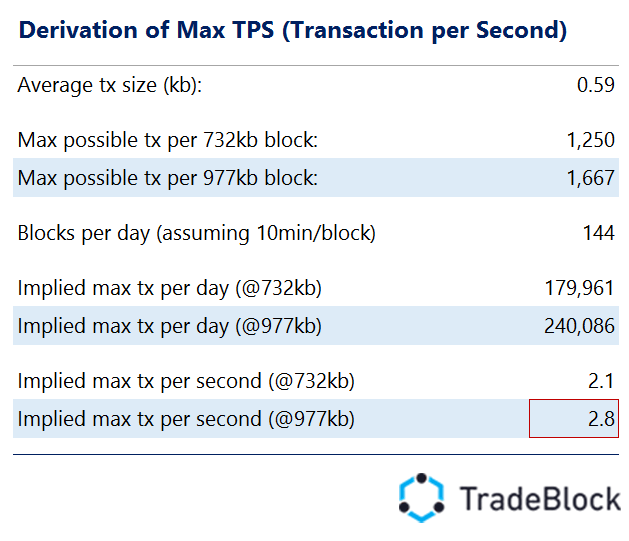 In addition, in his example, not only is there unnecessary foreign exchange fees in moving into and out of bitcoin, but transactions do not occur instantaneously (even zero-confirmations take longer than a card swipe). Furthermore, the current Bitcoin network is unable to handle everyone wanting to use bitcoin today (there is a continuous backlog of unconfirmed transactions, sometime measuring into the thousands). One thing he could have mentioned is that that foreign exchange trades may offset merchant fees, but he did not (yet). You may use a payment processor such as BitPay to instantly convert the bitcoins you receive into dollars. I may use a wallet that instantly converts dollars to Bitcoin at the time I want to make a payment. We both have trust relationships with intermediaries, but because the transaction and settlement occurs on the blockchain, we no longer have to trust the same intermediary. There is no reason to use Bitcoin itself to do this. Since users on both ends of the transaction are not only identified but they also need to “trust” a trusted third party, they could just as easily use a different payment method. And empirically they do, hence one of the reasons why JP Koning wrote the first post in the first place. In practice, Bitcoin as a payment system is just an added friction: why go from USD->BTC->USD when a user can simply bypass this artificial friction and pay in USD? This is relevant when thinking about bringing the next few billion people online and into the global economy. These people will not have credit histories that are accessible to the same intermediaries that I am set up to use. They may have local intermediaries that they can use, or they may be willing to use Bitcoin directly. If that is the case, they will be able to enter into the stream of global commerce. In my lengthy book review on The Age of Cryptocurrency I explained 3-4 reasons for why Bitcoin probably is not the savior of the unbanked and underbanked. One of the reasons is volatility, another is compliance and customer acquisition costs. One more is the fact that nearly all venture capital (VC) funded hosted “wallets” and exchanges now require not only Know-Your-Customer (KYC) but in order for any type of fiat conversion, bank accounts. Thus there is a paradox: how can unbanked individuals connect a bank account they do not have to a platform that requires it? This question is never answered in the book yet it represents the single most difficult aspect to the on-boarding experience today. Thus contra, Dourado and others, Bitcoinland has recreated all of the same types of intermediaries as the traditional financial world, only with less oversight and immature financial controls. In terms of “rebittance,” in practice, what ends up happening in these emerging markets is that local residents attempt to cash out into their local currency, irrespective of whatever cryptocurrency funds were originally sent with.14 It is highly recommended that readers peruse analysis below in the notes from Yakov Kofner who studies this at SaveOnSend — looking at actual data such as margins and fees15 And again, maybe this will slightly change through the efforts of Align Commerce, Coins.ph and BitX but it has not yet. We will finally have a unified global financial system to which everyone will have access. Capital controls will become impossible, or nearly so. So in order to do apples-to-apples comparisons, we might want to examine other systems of final settlement. One such system is cash. Cash of course has some limitations, chief among them that it is not possible to send cash online without an intermediary. The problem with this is that cash in the real world is given exception to nemo dat and bitcoin is not. I tried pointing this out to him on Twitter, to which he responded with one word: “Absurd.” Nemo dat is the legal rule that states that Bob cannot purchase ownership of a possession from Alice if she herself does not have title to the possession. And it is not absurd. In fact, as described two months ago, when talking to attorneys such as Amor Sexton, Ryan Straus and George Fogg we learned that one of the problems facing bearer instruments like bitcoin is that many of these virtual assets do not have clean title — that they are encumbered. What this means is that while the Bitcoin network itself may provide settlement with respect to the transfer of private key credentials, on the edges of the network in the social ‘wet code’ world, the title to these credentials could be non-final. This means that because of how trusted third parties such as Xapo or Coinbase originally pooled and commingled (e.g., did not segregate) customer deposits, some customers may unknowingly end up with encumbered bitcoins. Whether anyone litigates on this issue may be a matter of time as Mt. Gox may have practiced the same behavior with pooled deposits. Direct settlement also means that machine-to-machine transactions will be possible without giving your toaster a line of credit or access to your full bank account. What new inventions will people create when stuff can earn and spend money? The core innovation around Bitcoin are censorship-resistant cash and its decentralized ledger — thus trying to merge costly pseudonomity with the KYC of a traditional financial system and then innovate on top of that seems like a one step forward and then one step back. Therefore it makes little sense for why Dourado, Antonis Polemitis, 21inc and others continue to bring up machine-to-machine as if it is the “killer app” for Bitcoin. What is the need for proof-of-work in these cases? I briefly looked at this in Appendix B: why can’t prepaid cards be used to pay for the same service? If parties — or washing machines and toasters — are known, what benefit does this asset provide that cannot be done with other systems? Why do you need to insert censorship-resistant virtual cash in a transaction that ultimately will need national currency on both sides of the transaction? 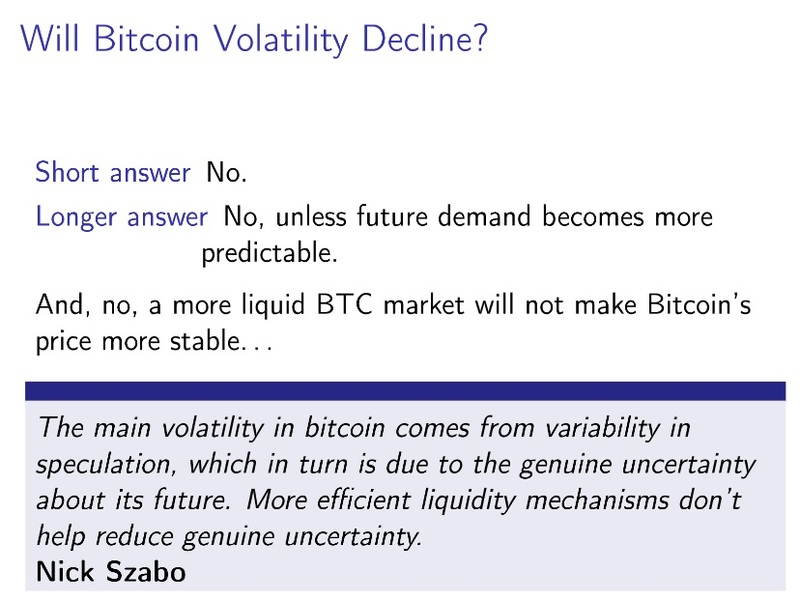 It is unlikely that many early adopters or those who believe static money supplies are a feature, will find any of the discussion above of merit.19 Yet, as Noah Smith pointed out again yesterday, bitcoin’s volatility may need to become “boring” (non-existent) if it ever were to become a viable medium-of-exchange. However as described above, there are multiple external factors for why this may not occur including the fact that there is no current method to automatically, trustlessly rebase the purchasing power in Bitcoin. Last fall Robert Sams published a short paper (pdf) proposing one solution, via a “stable coin” — an idea that has subsequently been explored by Ferdinando Ametrano20 and may eventually be emulated in projects like Augur and Spritzle. Whether or not this feature is adopted by the Bitcoin community remains and open question. What is probably not an open question is whether volatility will ever disappear for a perfectly inelastic money supply, particularly one without a type of rebasement mechanism. Yesterday at the MoneyConf in Belfast, BitPay’s CEO Stephen Pair announced that they were pivoting away from payments and towards technological infrastructure for banks and enterprises. This is an interesting announcement in that a year ago, almost to the day, I published an article, A Marginal Economy versus a Growth Economy, that mentioned how on-chain transaction volume was not following the growth in merchant adoption. That it was relatively flat. Reddit and parts of the Bitcoin community derided that analysis yet the data was correct. In fact, on-chain data later showed that BitPay volume plateaued throughout last year, see The flow of funds on the Bitcoin network in 2015 and A gift card economy: breaking down BitPay’s numbers. What kind of tech does BitPay currently offer the marketplace? ChainDB, introduced in March, though it seems a bit late to the party already started by ErisDB (and from Ripple’s NuDB). Copay is in a packed group of multisig offerings including GreenAddress, BitGo and CryptoCorp. Insight was their first API / blockchain explorer but everything has moved over to Bitcore. Bitcore competes with BlockCypher, Chain, Coinkite, Gem.co, Block.io and others. Foxtrot seems to also compete with IPFS (and perhaps to some degree Filecoin and DNSChain from okTurtles). Social media has recently been filled with other hype and rumors but no other big product lines have been announced (yet). There are a couple open questions. How will they scale and monetize to a new customer base after such a large pivot in an increasingly competitive fintech market? For instance, they built their company around consumer payments, but they have let about 20 people go over since the Bitbowl, including the Bitbowl team in large part because consumers as an aggregate did not spend bitcoins (their developer evangelist just left recently too). We keep adding merchants – we’re up to over 60,000 now — but they’re selling to the same pool of Bitcoin early adopters. At Bitpay we’ve never thought there’d be this overnight adoption where you get people using it this year or even next year. It’s going to take some time. In the industry there’s a realisation that yes it’s an incredible technology but it’s going to take a while for it to mature. Again, based on demographic research from CoinDesk and others the typical “owner” of a bitcoin is a North American male in their early 30s that is not living hand-to-mouth.1 They likely have a low-time preference and long-term time horizon and thus are unlikely to spend bitcoins because they view it as an investment, not virtual cash.2 Another data point: in moving to Switzerland, Wences Casares noted that 96% of the customer deposits on Xapo do not move, that they are stagnant. But Xapo is primarily storage right? Why would customers frequently move their deposits in and out of bunkers? One other thing I’ve had some people ask me IRL and I’ve seen on reddit occasionally too, is this concept of more merchants coming on board in bitcoin and that causing selling pressure, or the price to go down. [Coinbase is] one of the largest merchant processors, I really don’t think that is true. Well one, the volumes that merchants are processing aren’t negligible but they’re not super high especially when compared to people who are kind of buying and selling bitcoin. Like the trend is going in the right direction there but in absolute terms that’s still true. So I think that is largely a myth. “I believe merchants have been widely disappointed by the number of transactions they see in bitcoin,” Beauregard said. He went on to state that “consumer adoption is the problem”, speaking out against the ‘if you build it they will come’ mentality of the bitcoin ecosystem in past years. Thus it is unsurprising that a company, BitPay, that in public previously stated it would generate revenue via transaction and SaaS fees, was unable to in a market filled with stagnant coins. Behind the scenes, as described later below, they were telling people (and investors) that they hoped to generate money via the market appreciation of bitcoins themselves. Is it the only explanation? Q: There was a lot of stories in the press about BitPay laying off people, can you comment on that? A: Yea, what happened was we had a high burn rate and the company necessarily needed to scale back a little bit on how many people we hired, how many people we had on board, how much we sponsored things. I mean things were getting a little bit out of hand with sponsorships, football games and expansion — more care needed to be put on how and where we spent the money. Q: Can you elaborate on the burn rate? Tim Swanson wrote a piece on BitPay in April, published this piece about the economy, the BitPay economy. Posted this piece on the burn rate and actual figures, have you read that piece? Can you comment on that? A: Yes, it is especially hard for a company to build traction when they start off. Any start up is difficult to build traction. It’s doubly hard, the hardness is amplified when a company enters a market with competitors that have near unlimited resources because the other companies can either blow you out of the water or have better marketing strategies or they can do a ton of different things to make your startup more irrelevant. Standard in any company but it is doubly difficult when you enter a market like that. In the payments industry, forget about Bitcoin for a second, in the payments industry and the mobile commerce, ecommerce, company-to-company payments industry there are massive players with investments and venture backed companies in the billions. Competing at that stage is tricky and it necessarily requires a burn rate that is much higher than the average startup because of how you need to compete in this space. What is also important is that the regulation costs a lot of money for the startups in the Bitcoin economy. It’s the perfect storm of how a startup will be hit with a ton of expenses early on and that can hurt the growth of a company. Even though a lot of the money that went into it was growth capital it takes a while to get the balance right between spending and growing. I do think this explains some of the pivot but not all of it. According to AngelList, at the time of this writing there are 1,870 payments startups. Some of these, as Levin stated, are well-funded. While it likely will not win any friends on Reddit, I think BitPay’s effort to succeed in consumer payments was likely hindered due to the first factor, the fixed inelastic money supply. There is a different reason for why we maybe should be concerned about the appreciation of the exchange rate because whenever you have an economy where the expected return on the medium of exchange is greater than the expected return of the underlying economy you get this scenario, kind of like what you have in Bitcoin. Where there is underinvestment in the actual trade in goods and services. For example, I don’t know exactly how much of bitcoin is being held as “savings” in cold storage wallets but the number is probably around $5 billion or more, many multiples greater than the amount of venture capital investment that has gone into the Bitcoin space. Wouldn’t it be a lot better if we had an economy, where instead of people hoarding the bitcoin, were buying bitshares and bitbonds. The savings were actually in investments that went into the economy to fund startups, to pay programmers, to build really cool stuff, instead of just sitting on coin. I think one of the reasons why that organic endogenous growth and investment in the community isn’t there is because of this deflationary nature of bitcoin. And instead what we get is our investment coming from the traditional analogue economy, of venture capitalists. It’s like an economy where the investment is coming from some external country where Silicon Valley becomes like the Bitcoin equivalent of People’s Bank of China. And I would much prefer to see more organic investment within the cryptocurrency space. And I think the deflationary nature of bitcoin does discourage that. Based on talks with several other companies in the same space, it is probably not the last announcement of a pivot out of consumer payments. So hire experts in financial services right? It might not be so easy. How will all the bitcoins sitting on BitPay’s books impact their ability to pivot? The video above is a clip from an two week old interview with Jason Dreyzehner a UI/UX engineer at BitPay. Banks are desperate to figure out how to apply this technology to mainstream currencies and the likes of Citi, UBS and Santander are all looking at blockchain technology. I’m not sure what banks Pair has been talking to but from my conversations they are not primarily looking at how to “apply this technology” for currencies. Though perhaps my sample size is too small. Rather, in my experience, financial institutions are looking at how to use some kind of distributed ledger to achieve a number of goals, namely in reducing cost centers and complexities within the back office and this is (so far) largely unrelated to currencies. In light of recent regulations, and their impact – I see several bitcoin companies pivoting. Payment processing was already a tight margin business when it wasn’t considered an MSB. Now with the regulatory costs involved, it would be a challenging line of business for any startup. ChainDB and Copay are outstanding, and Bitpay’s open source culture makes them a desirable place to work. The regulatory environment may be a blessing in disguise as it can free some companies from investor and branding pressure. Freeing them to pursue new models. I think that’s really challenging. Not only is it a different development skillset to do SaaS, but the existing team may not want to work on that model. I’ve been publicly speaking out for the last year about merchant adoption sharply our pacing consumer adoption. Whereas BitPay is shifting their focus to helping banks settle transactions more quickly, GoCoin has decided to address the problem head-on. Clearly merchants see the value proposition, so the thesis behind our merger with Ziftr is to combine our technologies to provide consumers incentives in the ways they currently expect them. The new merged GoCoin / Ziftr will provide merchants with a digital coupon platform where they can give coins to consumers as incentive to make product purchases. Our wallet will be a hybrid in that it will store tokenized credit cards similar to ApplePay, yet also enable payments with multiple cryptocurrencies including Bitcoin, Litecoin, Dogecoin, tether and zifterCOIN. While I agree the consumer adoption is not happening at the pace any of the early pioneers believed it would, but we are taking the dog to the fight so to speak to provide the tools to merchants to change the behavior to the safest, lowest cost payment alternative. Tim, your thoughts on the cost of regulation and market size already provide a reasonable framework for explaining the recent developments. What I would like to contribute to those is the issue with the “bifurcation” of the bitcoin startup scene. The first batch of bitcoin startups, which includes BitPay, is quite different from the second batch. In the first batch, you had entrepreneurs who got support from bitcoin early adopters to launch businesses that helped the ecosystem. In the second batch, you have serial entrepreneurs, running companies like Xapo, Circle and 21e6, who got millions from Silicon Valley VCs. Startups from the first batch have to make tough choices, given that interest in bitcoin (see price) is not what it used to be, and that they have to get “traditional” funding to survive. If they get such funding, like BitPay did, they may have active investors questioning the direction of the company, looking at the market size etc. In other words, the price of bitcoin and the lack of crowdfunding does not allow startups from the first batch, to continue working on “ideological” agendas, like bitcoin merchant and user adoption. Startups of the first batch can continue working on what they started on only if the bitcoin price rebounds, or if large bitcoin holders support them. BitPay had to pivot in order to create a sustainable business because it could not afford to do otherwise. CoinSimple, that provides a Blockchain.info-style merchant processing, because it never touches customer or merchant funds (unlike Coinbase, or BitPay), continues to try to contribute to wider Bitcoin merchant adoption. With a product that works, and we minimum overhead, we can afford to grow organically and contribute to the growth of the ecosystem. Whatever the reasons for pivoting were, this is a very fluid market place as companies are still looking to find product-market fits. The next post will look at what Noah Smith and JP Koning have been writing on as it relates to a medium-of-exchange. A reporter from CoinDesk reached out yesterday to ask if there were any questions I had in relation to the final version of the BitLicense being released. They subsequently posted a follow-up story with one of the comments I sent. Below are the remaining questions and comments that came to mind after quickly reading through the final BitLicense. 1) When a miner (hasher) sends work to a pool, the pool typically keeps the reward money on the pool before sending it to the miner or until the miner manually removes it. Would mining pools be considered a custodian or depository institution since they control this asset? What if a pool begins offering other services to the miner and these assets remain on the pool? (e.g., some pools have vertically integrated with exchanges) Update: The mining pool BTC Guild has announced it is closing down and citing concerns over the BitLicense with respect to these issues. 2) Are there any distinguishing factors or characteristics for entities that issue or reissue virtual currencies? For instance, both non-profit groups (like Counterparty, Augur) and for-profit organizations (like Factom, Gems) issued virtual currencies and it appears that federated nodes that operate a sidechain, in theory, will effectively (re)issue assets as well. Are they all custodians? In light of the FinCEN enforcement action with Ripple, do these projects need to be filing suspicious activity reports (SAR) as well? A new story up on Fusion — Former Mt. Gox CEO: Current Bitcoin exchanges are a ‘disaster waiting to happen’ — looks at a recent post from Mark Karpeles regarding the segregation of financial controls within the Bitcoin exchange framework. I provided a couple of quotes for some perspective. In addition to the snippets in the article, it bears mentioning that I would disagree with his view that it is possible to make a fully decentralized exchange today due to the fact that cash is centrally created and thereupon controlled by a variety of agencies. He is right about the intersection of AML and how some companies are unable (or more likely, unwilling) to legally comply with it due to how they operate (such as LocalBitcoins and Purse.io). One last comment about that story, there may be ways to create financial controls to reduce the ability for maleficence to occur but as Karpeles ironically pointed out (he did not acknowledge it but probably is aware of it), by converting bitcoins into an altcoin, you effectively are delinking provenance and creating a money laundering mechanism. Based on a number of conversations with altcoin traders I suspect that a non-negligible portion of the litecoin trading volume on a daily basis (on BTC-e and ShapeShift.io) are related to money laundering type of activities. Though this would be hard to verify and prove without building a good network heuristic and/or access to the server logs at these companies.